I'm almost positive bread is my favorite food. 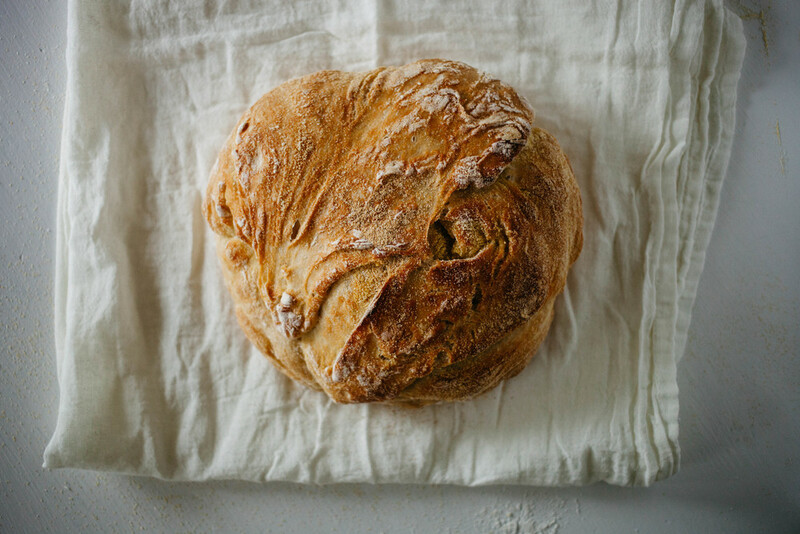 Mostly all complex carbohydrates in general — but warm, crusty bread is like a drug to me. I could eat it everyday with all my meals and always want more. It's magical and addictive. It rises, crackles and has the power to make your whole house smell like heaven. Of course, I didn't know this last bit in the first person until I recently decided to get over myself and use my hands to bake my own bread. Baking this loaf of bread was a game changer for me. Making bread has been something I’ve always wanted to do — but that day seemed far off because of my qualms about yeast and general assumption that it would be super difficult. I couldn’t have been more wrong — this recipe was so simple and will be the start of many more fresh loaves in my future. If you have any nervousness or made up excuses as to why baking bread is too much, listen to me, this is worth it. 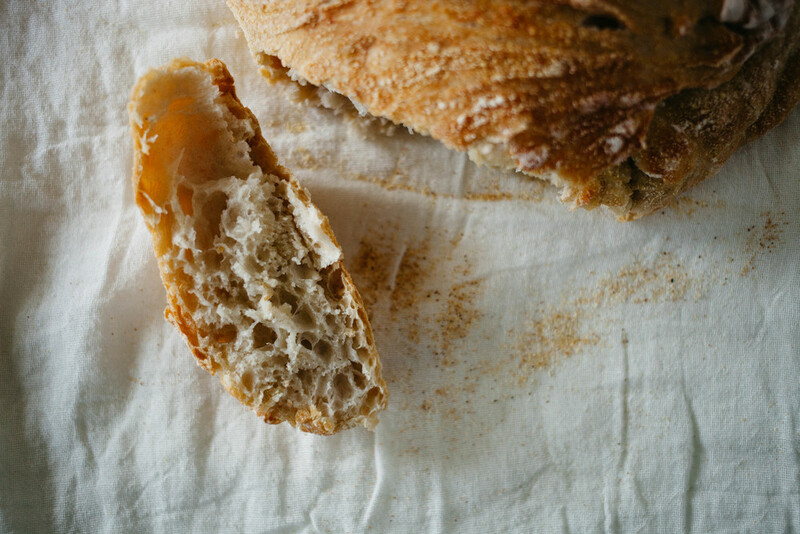 I used the recipe from “Bread & Wine” a book by one of my favorite authors, Shauna Niequist. Here are some of her words about this bread because they are EXACTLY how I felt about making it. Mix all of the dry ingredients in a medium bowl. Add water and incorporate with a wooden spoon for 30 seconds to 1 minute. Next, shape the dough into a ball. Generously coat a cotton towel with flour or corn meal; place the dough seam-side down on the towel and dust with flour. Cover the dough with a cotton towel and let rise 1 to 2 hours at room temperature until more than doubled in size. Preheat oven to 450 to 500 degrees. Place the pot in the oven to preheat at least 30 minutes prior to baking. Once the dough has more than doubled in volume, remove the pot from the oven and place the dough (removed from any towels) in the pot seam-side up. Cover with the lid and bake 30 minutes. Then remove the lid and bake 15 to 30 minutes uncovered, until the loaf is nicely browned. Enjoy every delicious bite my friend, you have just made bread!